Objective: To attract customers from neighbouring areas and stop leakage to other destinations while building loyalty and fostering creativity, innovation and community spirit. Royal Leamington Spa has a clear vision of its future direction and a strategy that places the customer at the centre of its decision making. By continuing to implement the Royal Leamington Spa ‘Story’, we actively and consistently promote the town’s offer to increase sales through events and promotions. We also help develop loyalty and pride in the town and embrace emerging technologies. With this in mind BID Leamington has undertaken an extensive amount of research and consultation. Following a series of 1:1 interviews with key stakeholders and a community workshop that was attended by 80 participants, BID Leamington identified Key Themes and the ‘Big Idea’ to guide promotion and future development of the town. This research was then fed into the development of a detailed Marketing Plan including Objectives, Key Performance Indicators (KPIs), Identification of Key Audiences and Key Messages which inform all the Marketing and Promotional Activities. BID Leamington also developed a Graphic Language and Photographic Gallery which is now available to support BID’s promotions as well as other businesses who wish to promote themselves within Royal Leamington Spa. Finally we identified how this research can enhance your own marketing and how everyone in the business district can help to ensure Royal Leamington Spa’s proposition is as powerful as possible. 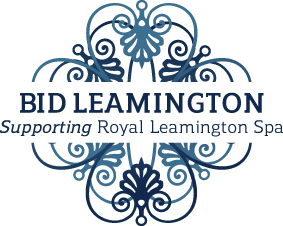 Using this information, BID Leamington’s aim is to deliver a customer-driven programme that tackles issues identified by businesses with the aim of increasing the number of people that visit, return and invest in Royal Leamington Spa. Stakeholders were asked the following questions to help understand Royal Leamington Spa’s offer and strategic direction. This was distilled into 3 themes and a big idea. What is Leamington Spa for? Who is Leamington Spa for? Why is Leamington Spa different? What is Leamington Spa’s ambition? What is Leamington Spa’s ‘story’ / what are we saying about the town? Over 5,500 posts have been made on social media this year, with over 400 businesses specifically mentioned. There are at least 8 posts per day on various targeted accounts. 9% increase in Facebook and Twitter and a further 40% increase in Instagram followers in the last 12 months. Achieved a significant annual increase in engagement across all the digital platforms we manage. This includes seven of the town’s most visited websites and six different social media platforms. Monthly local and regional advertising with Live 24/7,Edge /Cornfield, Observer and Courier as well as editorial. To date 80 businesses have been specifically mentioned in copy. Attracted an estimated 27,000 visitors to the spectacular Food and Drink Festival and raised over £35,000 additional revenue to support the event. Delivered extensive marketing and PR campaigns monthly across a range of media (trainlines, coach operators, radio, print, digital, social media) from London to Birmingham and beyond. In the four goodie bag promotions during the year, 100 businesses gave us flyers to distribute in 2000 branded cotton shoppers. This represents us distributing over 200,000 flyers on their behalf. ‘Leamington Angels’ high street ambassadors returned and engaged with hundreds of customers over the Christmas trading period. Around 5000 people attended the Christmas Lantern Parade. Over 200 presents were donated to Children’s Support in Holly Walk and Helping Hands. Christmas campaign exceeded all targets. Events and promotions included the ‘Golden Ticket’ (over 3000 entries – return rate 8%). Over 150 multiple and independent retailers involved in the September 2017 & May 2018 Little Book of Offers. 20,000 books printed. Achieved increased participation in events and promotions with over 560 direct business engagements throughout the year. Leamington on Air! – Touch Radio & Free Radio advertising campaigns in February, March, July, August, November and December as well as numerous interviews. Distributed over 140,000 Maps and Visitor Guides including the ‘Taste Leamington’ Visitor Guide listing all our eateries in the Town Centre. These are distributed via local Visitor Information Centres, hotels and B&B’s throughout the region. Runner-up in British BIDs 2015 National ‘Proud Project’ Place Marketing Awards for the Food & Drink Festival 2015. BID Leamington also won this in 2012 and 2014 and was runner up in 2013. Shortlisted for the BCSC Purple Apple Marketing Awards in 2016 for the ‘Experience a Magical Christmas’ campaign delivered in partnership with the Royal Priors Shopping Centre. Secured £21,000 of additional funding to deliver free WIFI within a key part of the town centre. This will also offer a bespoke landing page to promote activities in the town, footfall data and user data. Leamington Angels was featured on BBC Midlands Today (6pm & 10pm News). Christmas campaign exceeded all targets and attracted £590,000 of press coverage in the local and national media. Achieved a significant annual increase in engagement and reach across all the digital platforms we manage. This includes seven of the town’s most visited websites and six different social media platforms. Over 5000 posts have been made on social media, with over 400 businesses specifically mentioned. There are at least 8 posts per day on various targeted accounts. Monthly local and regional advertising with Live 24/7, Edge, Observer and Courier as well as editorial. To date 100 businesses have been specifically mentioned in copy. Developed an ‘Augmented Reality’ Christmas window using the ‘Layar’ App which brought the window to life with moving animations. This was the first of its kind in the UK and though the use of Royal Priors WIFI, resulted in an additional 3,000 email contacts. Achieved increased organic social media growth including a 24.7% increase in Facebook likes (4,523 likes) a 33.8% increase in Twitter followers (7,787 followers) and 211% increase in Instagram followers (791 followers) in the last 12 months. Attracted an estimated 30,000 visitors to the spectacular Food Drink Festival and raised over £30,000 additional revenue to support the event. Launched the ‘Great Leamington Bake Off’ and generated PR with an equivalent advertising value (EAV) of almost £100,000. Over 5000 people attended the Christmas Lantern Parade. This was a 150 % increase on the previous year and the Facebook ‘event page’ had over 5800 engagements. The ‘Golden Ticket’ promotion had a strong return rate of 8.4% with 3376 entries. Over 111 multiple and independent retailers involved in the September 2015 & May 2016 Little Book of Offers. 25,000 books printed. Achieved increased participation with over 560 direct business engagements in events and promotions throughout the year. In each of the four goodie bag promotions 25-35 businesses gave us flyers to distribute in 500-1000 branded cotton shoppers. This represents us distributing over 40,000 fliers on behalf of around 100 local businesses. Leamington on Air! – Touch Radio & Free Radio advertising campaigns in February, August, November and December as well as numerous interviews. Distributed over 40,000 Maps and Visitor Guides including the ‘Late Night Leam’ Visitor Guide listing evening economy businesses. These are distributed via local Visitor Information Centres, hotels and B&B’s throughout the region. Runner up for the British BIDs 2013 National ‘Proud Project’ Award for the Leamington Lantern Parade, following the success of winning the award in 2012 for the ‘Golden Ticket’. Attracted an estimated 25,000 visitors to the spectacular Food Drink Festival and raised over £18,000 additional revenue to support the event. Showcased 15 businesses via the Taste Trail with 1000 tickets sold. Achieved a strong Christmas trading period particularly in the Royal Priors Shopping Centre where 67% of retailers achieved or exceeded their targets foot fall was up 2% on last year in the Christmas period and up by 5% in sale week (Boxing Day – New Year). Continued to implement Royal Leamington Spa ‘Story’ and delivered powerful marketing and promotions across a range of indoor and outdoor media. Over 80 multiple and independent retailers involved in the September 2013 & May 2014 Little Book of Offers. 25,000 books printed. Achieved a massive 13% response rate to the Christmas Golden Ticket promotion with over 6000 entries from in-store visits plus valuable postcode data and 1000 new email addresses collected. Received £8500 from the County Council operation footfall grant and launched the ‘Love Leam’ month of activities in February. This included promoting 35 events and 6 competitions on behalf of local businesses. Sammy’s Elephant Trail had 55 entries, ‘Tell us Why You Love Leam’ poetry competition had 24 entries. We launched the ‘Love Leam Challenge’ and distributed 5000 ‘Love Leam’ postcards plus 2000 ‘Vintage Leam’ flyers. This was backed up by a month of local regional advertising in papers, magazines and on the radio. Launched the LoveLeamington.com website including the #loveleam homepage to showcase local tweets, events and offers. The website had 6910 hits during February and now gets an average of 1300 visitors per month. Launched a ‘Fashion on the Move’ event in February. 15 fashion retailers took part and 2000 ‘love leam’ goodies bags were distributed containing offers from 25 businesses. Continued to update and improve the new Royal-Leamington-Spa.co.uk website. It gets an average of 23,000 visitors per month. Launched the ‘Late Night Leam’ Visitor Guide listing evening economy businesses – 5,000 distributed locally. Continued to develop the Leamington Spa’kle Loyalty Card Scheme. Distributed a further 1000 cards to pre-registered customers. A 53% increase in Facebook ‘likes’ (3126 likes) and a 93% increase in twitter ‘followers’ (4061 followers) in the last 12 months. Over 1000 torch-lit lanterns carried by over 2000 people lit up Leamington during the Christmas Lantern Parade. Won £10,000 of bus advertising from Exterion Media in the 2016 ‘StreetReach’ competition. This was used to promote the ‘Summer of Fun’. Buses were seen as far away as Birmingham. Secured £5,000 of additional funding to deliver free town centre WIFI – with a bespoke landing page to promote activities in the town, and gather user data. Secured £5,000 of additional funding to host the ‘Leamington Star-Eaters’ event. This attracted over 80 participants and directly involved 15 businesses on the trail. Launched the ‘Taste Leamington’ brand and www.tasteleamington.com website which features a directory of 100 businesses, events, news, reviews, blogs and vlogs. Working in partnership with GFirst LEP, launched the #WDYT #LoveLeam digital campaign. Leamington is now in the top 30 of the UK Digital Influence Index – rising from 189 to 28 and putting it above rivals including Coventry (33), Stratford (208) and Warwick (322). are at least 8 posts per day on various targeted accounts. Achieved increased organic social media growth including a 26.7% increase in Facebook likes (5731 likes) a 53.4% increase in Twitter followers (11,942 followers) and 53% increase in Instagram followers in the last 12 months. Monthly local and regional advertising with Live 24/7, Edge /Cornfield, Observer and Courier as well as editorial. To date 100 businesses have been specifically mentioned in copy. Attracted an estimated 25,000 visitors to the spectacular Food and Drink Festival and raised over £35,000 additional revenue to support the event. Generated PR with an equivalent advertising value (EAV) of almost £100,000. shoppers. This represents us distributing over 40,000 flyers on behalf of around 100 local businesses. ‘Leamington Angel’ high street ambassadors returned and engaged with hundreds of customers over the Christmas trading period. Christmas campaign exceeded all targets. Events and promotions included the ‘Golden Ticket’ (over 3000 entries – return rate 10.9%), the Nutcracker Trail, the Myton Santa Dash (2000 Santas). Over 150 multiple and independent retailers involved in the September 2016 & May 2017 Little Book of Offers. 20,000 books printed. December as well as numerous interviews. Distributed over 40,000 Maps and Visitor Guides including the ‘Taste Leamington’ Visitor Guide listing all our eateries in the Town Centre. These are distributed via local Visitor Information Centres, hotels and B&B’s throughout the region. Winner of the British BIDs 2014 National ‘Proud Project’ Place Marketing Award for the Royal Leamington Spa RHS Chelsea 2014 project. BID Leamington also won this in 2012 and was runner up in 2013. Attracted an estimated 25,000 visitors to the spectacular Food Drink Festival and raised over £30,000 additional revenue to support the event. Launch the ‘Home Cook of the Year’ Competition generating PR with an equivalent advertising value (EAV) of almost £100,000. Over 80 multiple and independent retailers involved in the September 2014 & May 2015 Little Book of Offers. 25,000 books printed. Once again, achieved a massive 13% response rate to the Christmas Golden Ticket promotion with over 6000 entries from in-store visits plus valuable postcode data and email addresses collected. 96 gifts were donated from 75 businesses with a value of over £5000. The ‘Love Leam’ month of activities in February grew in popularity and impact. The hashtag #LoveLeam is now firmly embedded into the narrative of the town. Events and competitions included the ‘Red Windows’ Competition with 11 entries, the distribution of 200 ‘Treat Someone Special Today’ balloons on Valentine’s Day, and ‘Fashion on the Move’ where 12 fashion retailers took part and 2000 ‘love leam’ goody bags were distributed containing offers from 25 businesses. This was backed up by a month of local and regional advertising in papers, magazines and on the radio inviting the town to take the ‘Love Leam Challenge’. The LoveLeamington.com website– including the #loveleam homepage to showcase local tweets, events and offers had 6910 hits/ engagements during February and now gets an average of 1300 visitors per month. Updated and launched a new responsive Royal-Leamington-Spa.co.uk website. It gets an average of 28,000 visitors per month. Leamington on Air! Touch Radio & Free Radio advertising campaigns in February, August, November and December. Distributed the full range of over 80,000 Maps and Business Guides including the ‘Late Night Leam’ Visitor Guide listing evening economy businesses. Launched a Royal Leamington Spa Instagram account and a Royal Leamington Spa ‘You Tube Channel’ with two short films. Achieved steady organic social media growth including a 16% increase in Facebook likes (3625 likes) and a 44% increase in twitter ‘followers’ (5821 followers) in the last 12 months. Over 1000 torch-lit lanterns illuminated up Leamington during the Christmas Lantern Parade.